Air Design Solutions offer a complete design, manufacture and installation service. Our products include kitchen canopy systems and stand - alone ventilation systems for both the commercial and private sectors. Our systems have been installed in the South, South West, South East of England, Wales and the Midlands. Our team of specialist engineers will 'site visit' and produce drawings for systems to match exactly clients requirements. All projects are conducted in a 'partnership' relationship with our clients. We pride ourselves on meeting project delivery deadlines. Air Design Solution engineers' are not sales persons. They give honest and practical solutions to clients' requirements. Air Design Solutions design, manufacture and install kitchen cooker canopies and intake/extract systems. All canopies are manufactured from 304 or 316 grades stainless steel. Non exposed components are made from galvanised steel. All systems are configured for maximum air supply and efficiency. All work is fully guaranteed and compliant with BS 6173:2001 (section 10) and Gas Safety (Installation and Use) Regulations 1998 section 27(4). We supply bespoke ventilation systems to both commercial and private premises. Our systems extract moist, stale air from the building and replace it with clean, filtered fresh air. For maximum energy efficiency, heat is recovered from the expelled air and transferred to the incoming fresh air. We are able to supply a variety of heat recovery units. Clean, filtered air into premises through wall or roof penetrations. 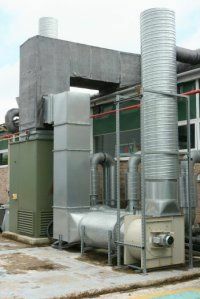 We can supply a bespoke system for all types of fumes, odours and dusts removal. These systems can be 'workstation' specific or ambient, dependent on the clients' needs.